I like to think of the Tropicannas as a trilogy of summer smash hit movies filled with action, drama and catchy titles. Tesselaar is the Australian based production studio where stars are born before being marketed to the masses with catchy names and full color plant tags. The most recent installment to this trilogy of blockbusters is deliciously dark, edgy and even has a surprise twist ending! The purple flower spikes erupt in a fiery explosion so intense that… oh, did I spoil the ending for you? Our story begins in a faraway land, across the Atlantic Ocean. (Feel free to skip ahead if history bores you) The popularity of cannas peaked in exotic obsessed Victorian England, before being abandoned in favor of the muted color schemes made popular by designers like Gertrude Jekkyl. 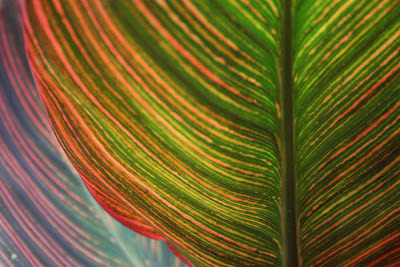 Luckily, cannas managed to survive in neglect until slowly gaining a foothold in the 80’s with new colorfully variegated cannas arriving to match the gaudy and wild taste of the decade. 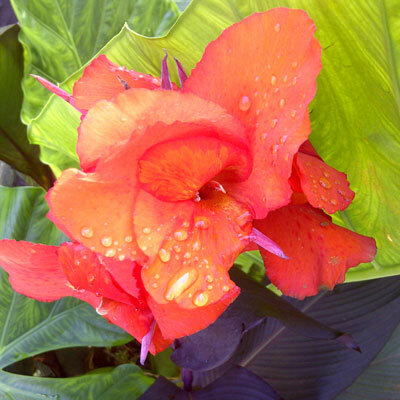 Cannas were recovering from the post-war funk, but it wasn’t until the late 90’s that they reached rock star status. Come to think of it, they were more like glam 80’s rock stars rather than grungy 90’s rock stars. Moving on. At the turn of the millennium, the Tropicannas had arrived. They took the gardening world by storm with their distinctively orange striped leaves popping up in print everywhere as the perfect tropicalesque ‘thriller’ plants to add excitement to the border. Tropicanna Gold (the sequel) was released in 2003 with a perfect one-two punch of golden striped foliage and flaming orange flowers. Now that these party animals had made their way to big box retailers, entirely new color combinations were now possible to the average Joe gardener, at least to those who’ve never heard of cultivars like ‘Phaison’ or ‘Durban’ before. Variegated cannas were nothing new, but pushing them out to nationwide retailers with celebrity personas and marketing elements was just the star treatment that cannas needed to undergo a full scale revival. Hallelujah! After the dust had begun to settle, Tesselaar introduced a dark horse in 2007 with near-black foliage and blooms that melted from deep orange to a bloody crimson red: Tropicanna Black. Out of all three Tropicannas this one is the most subdued and versatile, but nothing if not bold and badass. If this was the third movie in a trilogy, it would be something along the lines of “Revenge of the Dark Side,” “Fade to Black” or maybe even “Shadow’s Flames.” If I was a gardener in my gothic high school days, I would write whole poems about it in my journal of bad gothic teenage poetry! Like many ‘black’ foliage plants, the leaves develop a deep purple to burgundy that just approaches a true black. 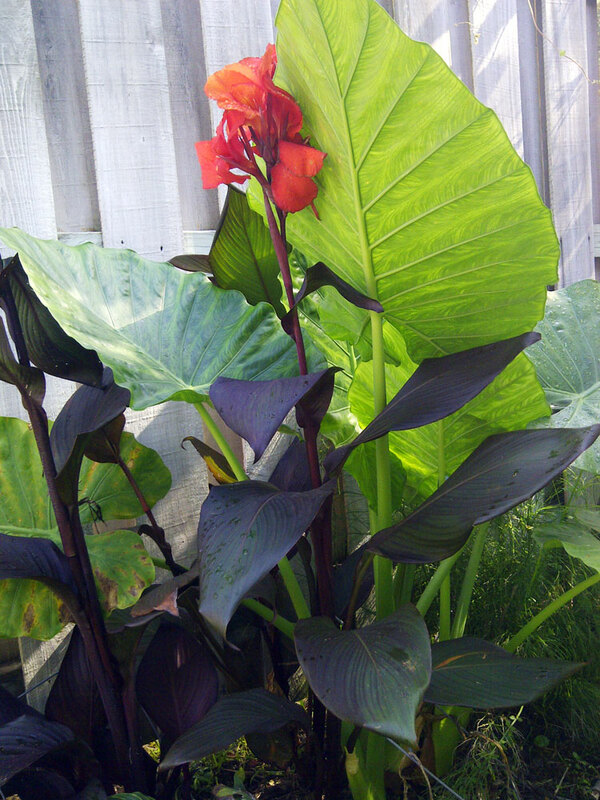 There are cannas with darker foliage (My mother in law’s ‘Australia’ cannas are darker) but Tropicanna Black is especially useful for its size; just tall enough to put those blooms at eye level, but not too large for container plantings. Oh, and if you couldn’t tell by these photos, the blooms are as red as my black and beating heart. Sorry, I lapsed back into bad teenage goth poetry there for a bit. 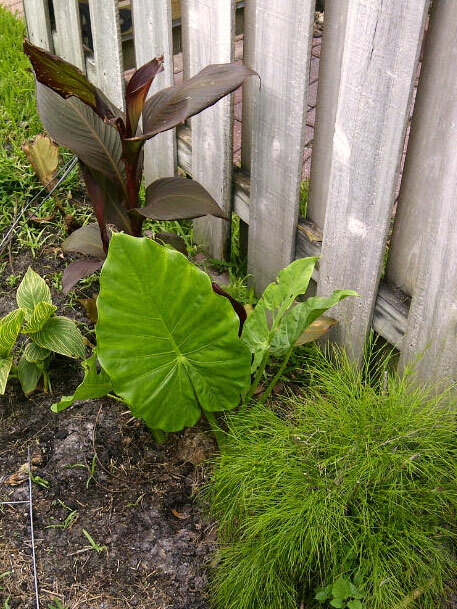 Mine were planted alongside the equally bold leaves of an Alocasia macrorrhiza, but for the best effect, contrast these big and beautiful black leaves with the fine textures of grasses and ferns. 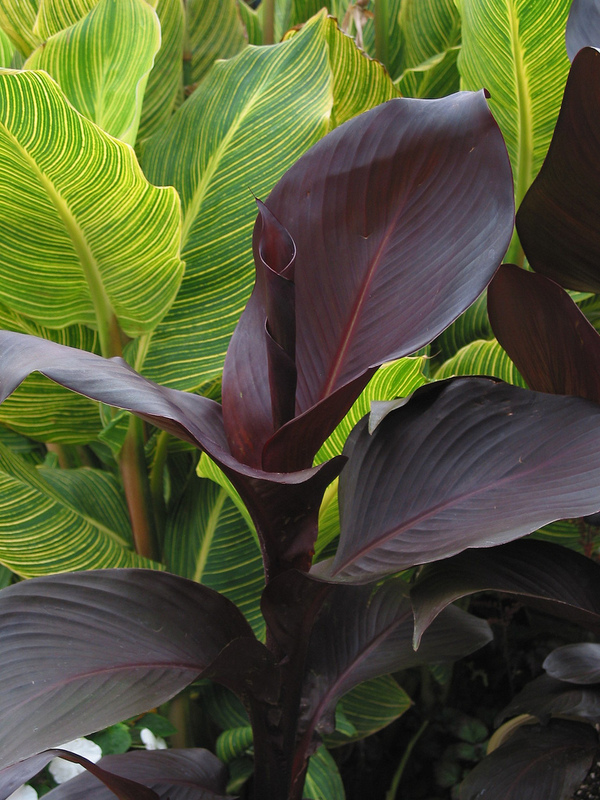 I would love to see this deep burgundy canna planted amongst plants with white variegated or silver leaves such as snowbush, silver buttonwood, viburnum or texas sage. Speaking of sage, how about incorporating the deep purple colored leaves along a sage painted wall? Tropicanna Black and other cannas are easy in any climate, but here are some tips. 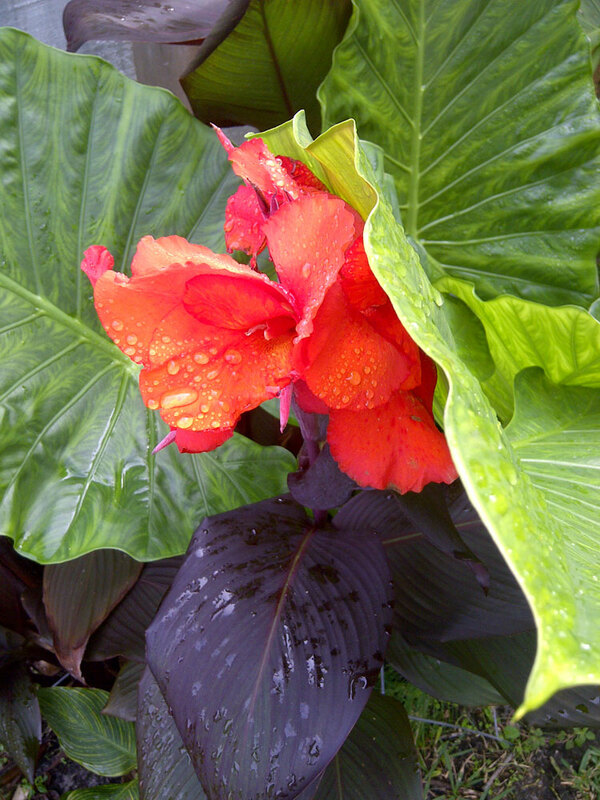 Cannas will have better foliage color and blooms in full sun, though Tropicanna Black can handle more shade than its two predecessors. Provide the richest soil possible and never let the soil dry out for too long. They can survive a drought, but trust me. It doesn’t look pretty. Cut stems off at the base after flowering to get new growth at the base. 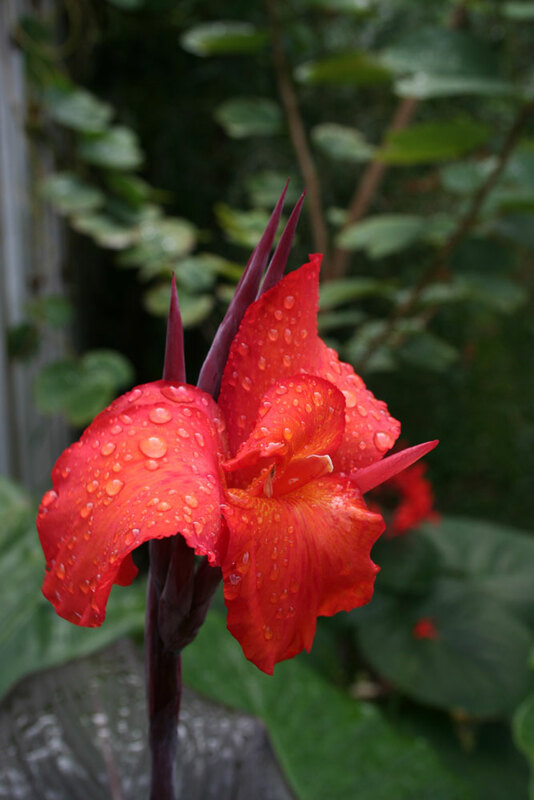 If you’re growing cannas in zones 7 and up, dig them up in fall before the ground freezes. Cut back the stems to about four inches from the root, and let dry before storing them in a cool dark place until spring. See the difference between the Black and Gold Tropicannas in early summer? When Tesselaar sent some trial canna rhizomes to my doorstep this March, I was still mourning the loss my last cannas and chomping at the bit to give all three varieties another go. I always end up losing them to nematodes, viruses and canna leaf rollers and never see them through to a decent bloom. Tropicanna Orange isn't half bad either! Here’s how all three did in my garden. The original Tropicanna Orange was planted in a drier spot and a soggier spot. 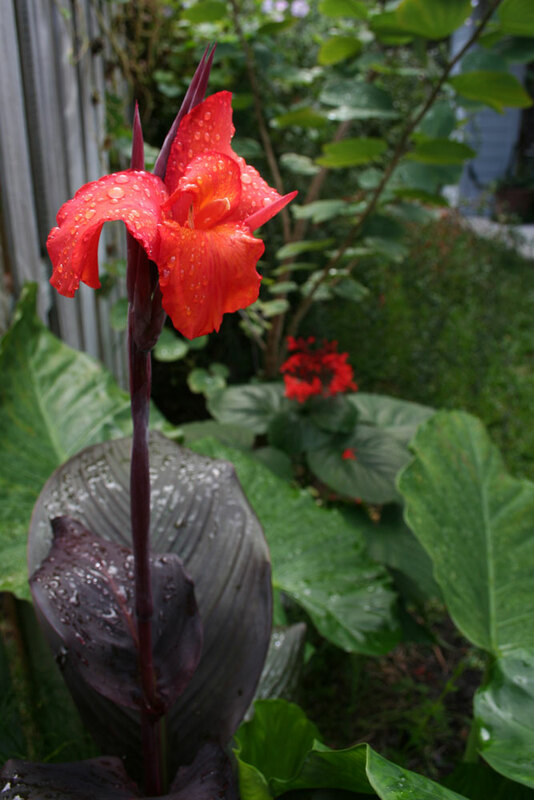 The one planted in the drier front yard died, while the canna planted in moist and rich soil bloomed once or twice earlier in the year before slowing down in fall. Tropicanna Gold was planted right next to Tropicanna Black, but I never got a single bloom all year, thanks to leaf rollers and rotting stems. 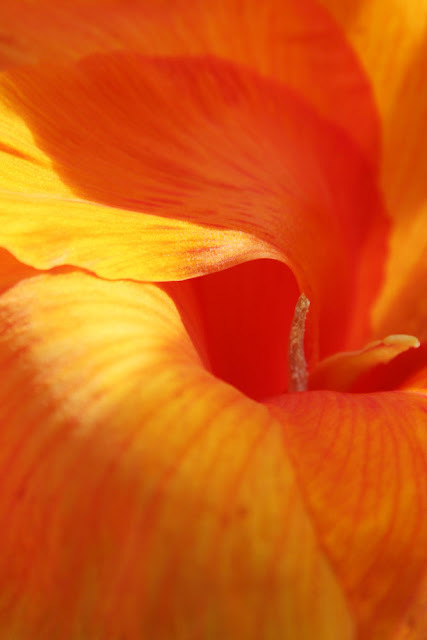 A macro shot of Tropicanna Orange's flower. The Tropicanna Black rhizomes were planted literally inches away from the miserable Tropicanna Gold plants, but had already formed a substantial clump and bloomed several times in the same amount of time. It could just be a coincidence, but these black cannas had succeeded in the same spot where I had lost other generations of cannas to a host of problems, problems that weren’t even touching this vigorous clump of Tropicanna Black. My ridiculously corny verdict? 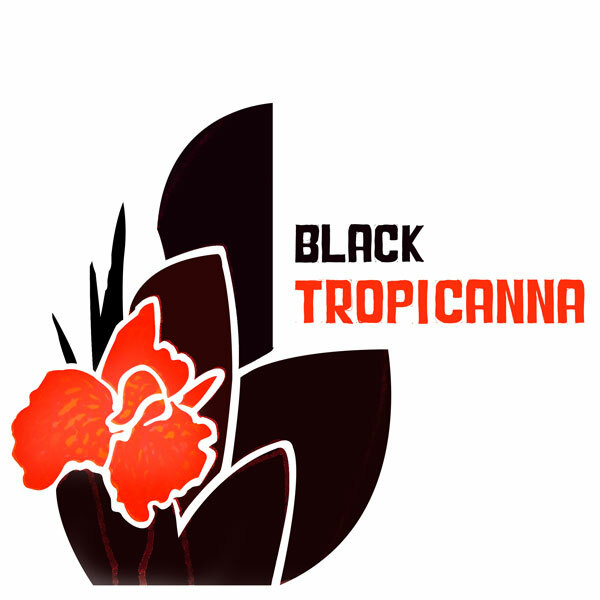 Cue the 80’s rock star music and get out the popcorn, because Tropicanna is back in black! The y don't look good in winter, but I guess it's nice to leave them in the ground! The black one really is awesome. Look for it!